This stretch of soft white sand is aptly named Seventy-Five Mile Beach due to the fact that it’s 75 miles (121 kilometers) long. 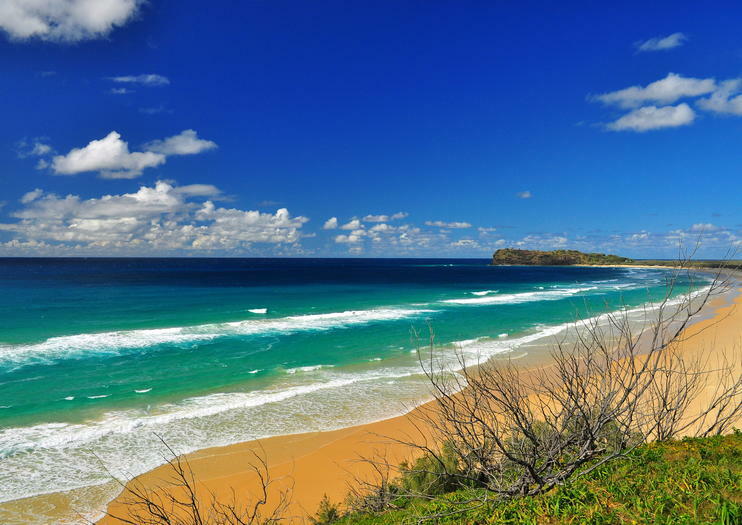 Running along majority of Fraser Island’s east coast, the beach offers a number of experiences, although swimming is not advised due to the high number of tiger sharks. That being said off-roading and fishing are popular pastimes on the beach, as is visiting its many attractions. If you are wanting to swim safely there are the Champagne Pools, natural rock pools that feature frothy Champagne-like bubbles when waves crash over the rocks. Additionally, Indian Head is a rocky outcrop popular for watching stingrays, fish, turtles, dolphins and sharks in the surf. Visitors can also visit the Maheno Wreck, once one of the world’s fastest ships and used for target practice by the Australian Airforce in WWII. After a bad storm in 1935 it was pushed to the beach’s shore as it was being towed to Japan to be scrapped. And no trip to Seventy-Five Mile Beach would be complete without experiencing Eli Creek, a crystal clear freshwater creek where you can enjoy a relaxing float. Something else interesting about Seventy-Five Mile Beach is it’s not just used for recreation, but also as a highway and runway, as the hard-packed sand makes for great off-roading and planes often land here.